Monday saw the conclusion of the American Library Association’s Choose Privacy Week, and this is the first year that the Calarco Library was involved with Choose Privacy Week. We created a LibGuide, Glog and these blog entries as a means to inform the Hopkins community. In addition to these collected sources of information, Mrs. Dubois also created a survey to help us learn what Hopkins students and faculty understand (or misunderstand) about online privacy. Of survey respondents, 38.5% were faculty members and 61.5% were students, with the largest percentage being 7th and 9th graders (23.1% each). 73.1% of respondents said they have a social networking account. The examples displayed for this question were Facebook, Twitter, Tumblr, and Pinterest. It would be interesting to find out how respondents would define and describe social networking. If an agreed upon definition, rather than examples, was included in the survey, would more respondents have answered yes? 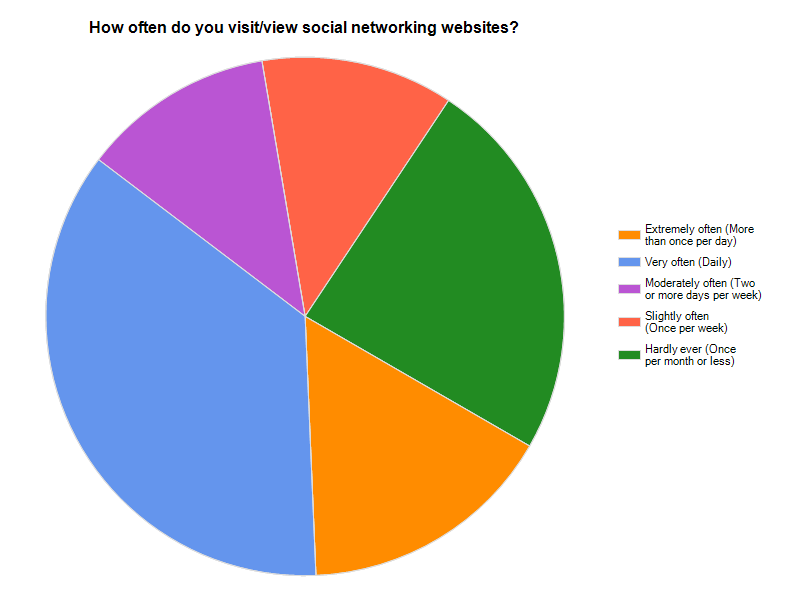 Regarding how often respondents visit their respective social networking accounts, 36% answered Very often (daily). However, 24% answered Hardly ever and represented the second largest group. Why do people sign up for social networking accounts and then decide not to regularly incorporate the services into their routines? About half (45.8%) of respondents state that they spend the majority of time looking at what other people have posted. Do people sign up for Facebook, Twitter, etc. primarily to create a presence online, or to keep track of other people? 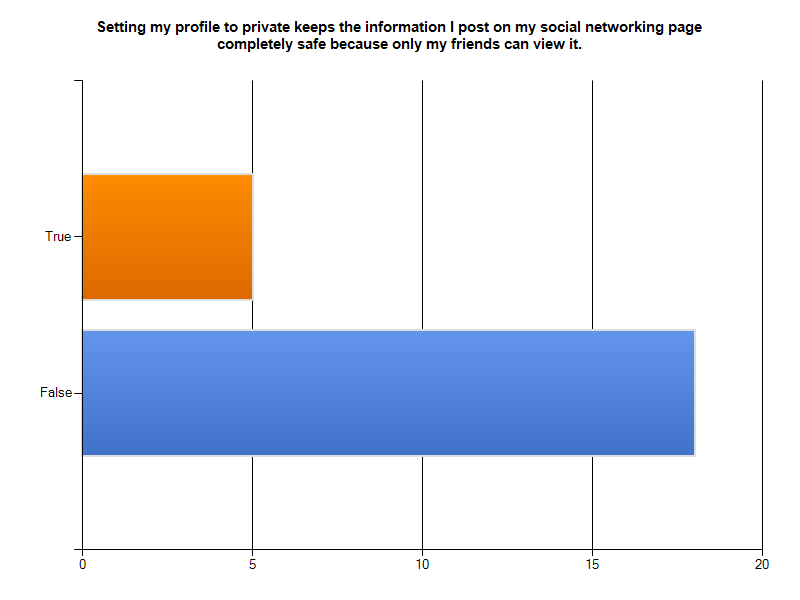 We incorporated a few T/F questions into the survey, one being, “Setting my profile to private keeps the information I post on my social networking page completely safe because only my friends can view it.” Although 78.3% answered False (woohoo! ), that leaves 21.7% of respondents who are confused about privacy and security settings. Does this matter if these are the same individuals who hardly utilize their accounts? In addition, are ALL respondents aware of privacy complexities such as third-party applications, location based services, targeted advertising and more? Individuals may be “using” their social networking accounts more often than they think; just because you do not update your profile picture or tweet everyday does not necessarily mean you rarely use your account. Another T/F question asked, “You always have control of all pictures of yourself posted online, even ones you do not post.” A large percentage (87.5%) of participants answered False, which indicates that most respondents are at least aware of the need to check and possible change privacy settings related to photos and tagging. 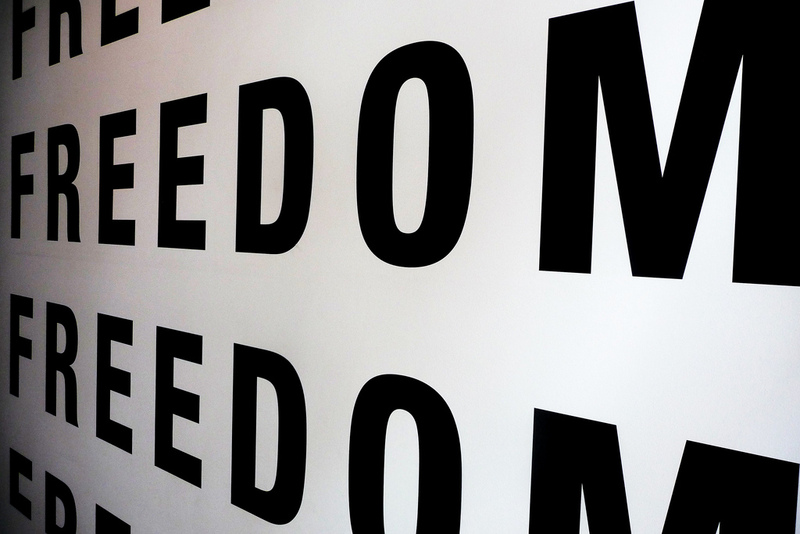 The goal of Choose Privacy Week is not to convince people to delete their Facebook accounts and blogs, or to make people feel they must read pages of “Terms and Conditions” before signing up with a service. The goal is to raise awareness of the risks and responsibilities that are entwined with the advancements made in web-based technologies, and to inform the community of the library’s mission to provide information and uphold the values of privacy. We hope our Choose Privacy Week observance encouraged you to take a closer look at your digital dossier. Do you feel more in control of your web-based identity? Comments, questions and suggestions for improvements are always welcome. Please comment on the blog or send an e-mail to jbarrows@hopkins.edu. This entry was posted in Privacy and tagged ALA, Choose Privacy Week, Digital Identity, Facebook, Libraries, Twitter on May 14, 2012 by Jenny Nicolelli.